We always get asked if we have anything scary or dangerous in our rooms. The answer is a big NO! Since we focus mainly on corporate team building, we like to be HR approved! Recently, it seems we’ve been getting asked a bit more than usual. That’s all thanks to the new movie from Columbia Pictures, Escape Room. Escape Room follows six strangers who are invited to participate in a hyper-immersive escape room experience. Unfortunately for them, the deadly puzzles and traps in the room aren’t all just for show. The six participants are subjected to extreme heat, below-freezing temperatures, dangerous pitfalls, and even deadly toxins. They are forced to solve puzzles and find hidden secrets to navigate through the perilous maze that their ‘Gamesmasters’ have created for them. Are they being punished for some crime? Is it all for some twisted third-party’s entertainment? Is it to teach the participants or the audience some moral lesson? Or is it simply a challenge with a prize that is worth risking their lives for? You’ll have to watch the film to find out. the room to hold the buttons for them. We feel that the best puzzles that promote good teamwork actually require two or more people to be working towards a solution, rather than just one person dictating exactly what to do to the rest of the players. 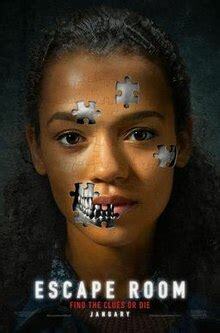 We will get into a little more about the puzzles and how the movie may have been improved in part two. We encourage those who have seen this movie to come try out one of our escape rooms. While they aren’t dangerous or deadly, the are definitely still a thrill! We encourage those who have seen this movie to come try out one of our rooms. Come test your puzzling skills and see how your team works under pressure in a fun (and safe) environment. Better yet, make a day of it! Go see the movie and then come to us, or the other way around. Can you escape in time? So call Urban Escape Games at 678-805-2189 and book your Escape Room or go to www.UrbanEscapeGames.com .